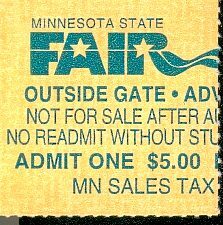 Went to the State Fair on Saturday morning! It’s a bit of a tradition here – I gather it started up as an agricultural fair, and now along with the livestock and tractor stalls it features food, funfair rides, food, bands, food, arts and crafts and food. The big thing is food on a stick – there’s everything from pork chops on a stick through corn dogs (hot dogs in dough, on a stick), pizza on a stick and this year for the first time deep fried candy bars on a stick. Of course in Scotland we’ve been doing the last one for a while, just not on a stick. Anyway, we made the most of our day, seeing the animals – sheep, goats, pigs (including really cute piglets and the biggest damn pig I’ve ever seen – it was 1200 pounds), some beautiful horses and lots of cows. There was one judged event where girls had made their costumes from wool, and wore these costumes while also showing off their sheep. We thought the extension would be to turn up with your three-legged pig and a bacon sandwich. We also saw lots of people, some arts and crafts and some fairly nice “fine” art, some of which was in fact pretty good. The atmosphere was fun, everyone along for a good time. We even managed to eat quite healthily – in amongst the hot dog and deep fried cheese curds stalls I found a place selling organic veggie wraps – yum yum. We were there for about 6 hours, it was pretty exhausting what with the heat and the crowds, but worth going. I crashed out completely when we got home, then went out to get a couple of videos (State and Main and The Mexican which we’ve still to watch), plus a Powerball ticket (didn’t win – darn) and a couple of steaks which I cooked up with some mashed potato and greens. Looking at all those cows must have put me in the mood for steak. Yum yum (again). This entry was posted on Monday, August 27th, 2001 at 13:31	and is filed under personal. You can follow any responses to this entry through the RSS 2.0 feed. You can leave a response, or trackback from your own site.